I finally found the bees! In fact, it’s been Buzzapaloosa around here. 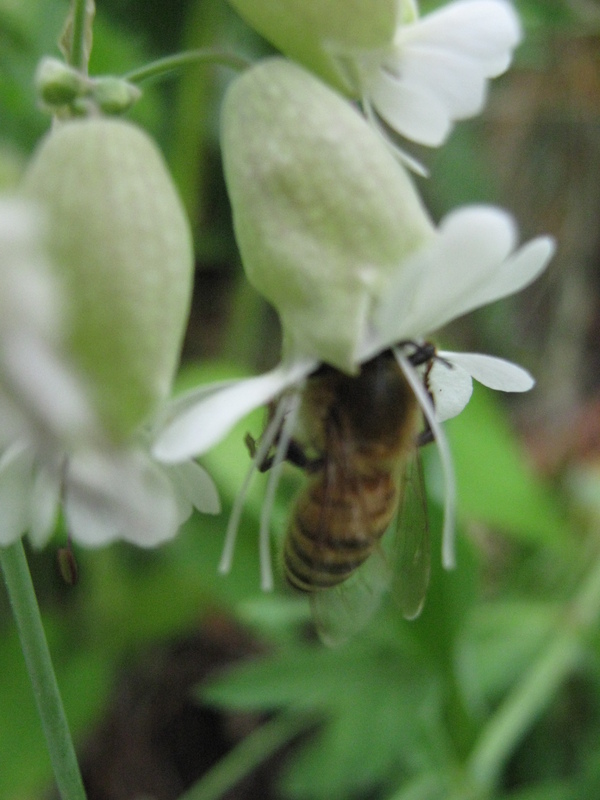 The honeybees have been hiding in the bladder campion. Nice to see I was remembering correctly that it’s a popular flower with them. The bumblebees are a lot easier to spot, naturally. 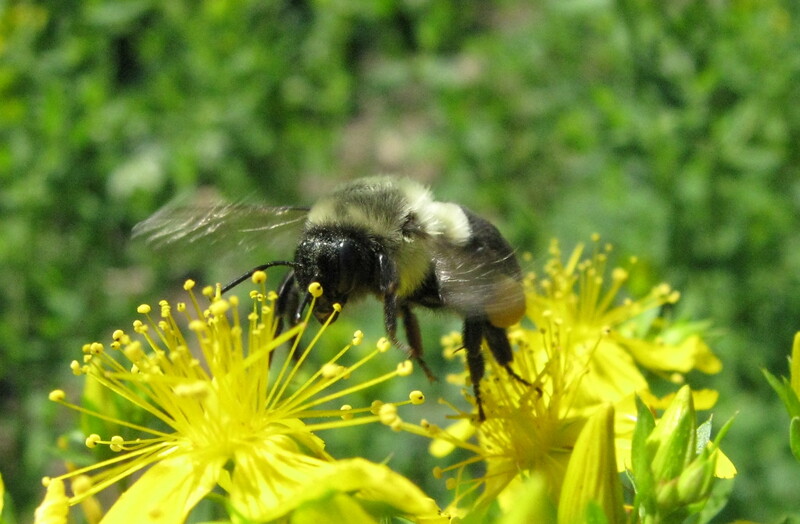 Here’s a bumblebee in flight between hypericum blossoms (St. John’s Wort). They amble about the garden in such a charming way. And how could you not love something so small and round and fuzzy? 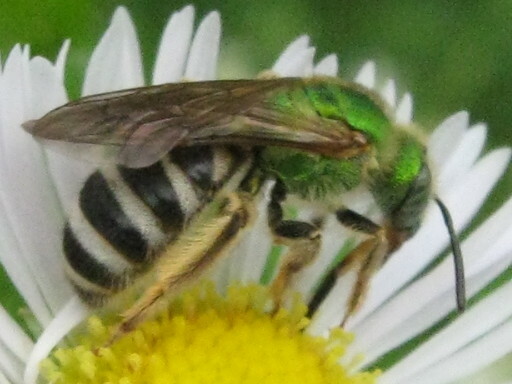 Some of the most beautiful bees are these tiny metallic green sweat bees. I can just see them as little glints of color flitting between the smallest flowers. Now I think I know what this is: Agapostemon virescens among the other little bees on the daisy fleabane. And here’s the tiniest one of all, little black dots mobbing the tall purple spikes of Veronica spicata. But zoom in and yes, that is a dark, so dark it’s almost black, dark green bee. 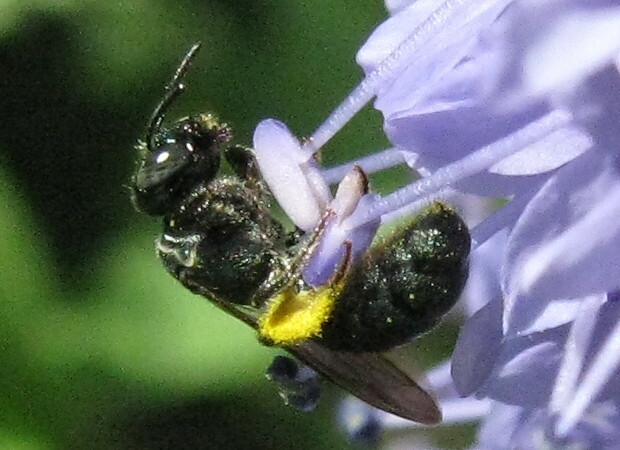 Update: It’s a small carpenter bee of genus Ceratina. This entry was posted in Bees, garden and tagged Agapostemon, bees, bumblebee, Ceratina, honeybee, weeds. Bookmark the permalink.